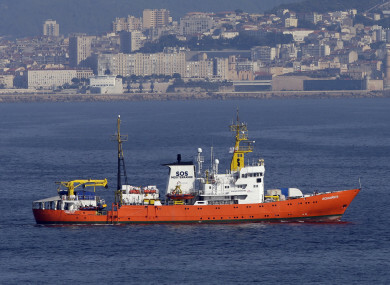 The French NGO "SOS Mediterranee" Aquarius ship . THE MALTESE GOVERNMENT has said it will allow the rescue ship Aquarius, which is stranded for the second time in the Mediterranean, to dock in Valletta. The government said the decision was made following discussion between a number of states which agreed on a responsibility sharing exercise regarding the rescued migrants on board the Aquarius. The government of Malta said in a statement that it will be making a concession allowing the vessel to dock “despite having no legal obligation to do so”. “Malta will serve as a logistical base and all of the reportedly 141 migrants will be distributed among France, Germany, Luxembourg, Portugal and Spain,” The government said in a statement. In a statement on Twitter, Spanish Prime Minister Pedro Sanchez said that Spain will take in 60 of the 141 migrants as part of the agreement with other European nations. “Spain has coordinated a pioneering agreement with six countries to distribute the reception of the people of the Aquarius. Spain will receive 60 people,” he wrote on Twitter. This is the second time that the Aquarius has been stranded in the Mediterranean, back in June the ship, was offered safe haven by Spain’s new Socialist government after being turned away by Italy and Malta with 630 people on board. Speaking to AFP on Monday, a Spanish government source said Madrid did not intend to repeat the gesture by allowing the Aquarius to dock in the eastern port of Valencia, saying it was “not the safest port” for the ship. While the overall numbers of migrants reaching Europe by sea is down from the peak in 2015, Spain has seen a steady increase in sea arrivals that began more than a year ago and has surged in recent months. Email “Malta to allow rescue ship Aquarius to dock but migrants will be sent to other EU countries ”. Feedback on “Malta to allow rescue ship Aquarius to dock but migrants will be sent to other EU countries ”.